Today I will talk about something that for some is magic but it really is so simple and easy that once explained, you’ll laugh a lot. I will talk about the fermions, not the Hermiones (Harry Potter). Widely accepted and known since we were children is to know that things are composed of atoms; atoms are composed of neutrons, protons and electrons. And so he stayed until the 50s a new element is discovered and was given the name of Enrico Fermi, a theoretical physicist, the fermion. But surely the elements of the atom are the last in the division ?. For if we study the forces of strong / weak among the elements of an atom (eg, a proton and an electron) interaction mathematically shows that “there must be something” within those elements that are those that generate these forces (so fast and to be understood), fermions. Fermions are particles, a group of fundamental particles, with bosons, are the basis of the elements of atoms. As I said, first, thanks to mathematics, were removed and then, thanks to particle accelerators hitting atoms together to desmontarles, it has proven its existence. The difference between a fermion and a boson that has some give mass (fermions) while others give forces (bosons). Come on, give some weight while others are responsible for the forces that generate the elements of the atom. Something simple. For example (and starting to reverse) bosons are responsible for the strong and weak force of the atom (gluons, W and Z, if I remember correctly) or the force of gravity (g). 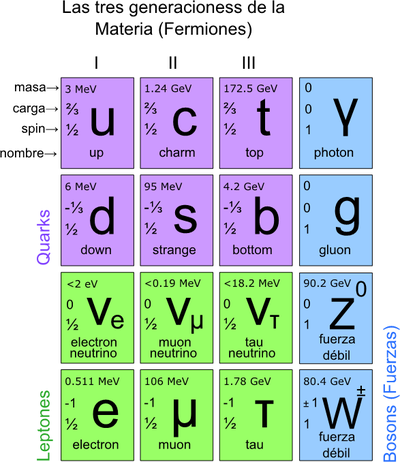 However, fermions (which in turn are divided into quarks and leptons) have essentially the mass of the element. And, as everything has to be united, fermions and bosons interact with each other (according to the theory of gauge fields) as a change rotations and symmetry. But this I will talk a little later. Turning to fermions, the type of fermion quark is forming the core particles (protons and neutrons), leptión lie that is the way the electrons. But if the electron has no mass or so they tell me ?, you will wonder. No, the electron has mass, small but has. As particles are fermions also have orbits and therefore have spin (for which revolve orbits) and if we add the burden may have, we have several divisions (apart from the quark and lepton). As you can see there are many classifications of these particles and that have not yet acabao to classify. Physicists, who are very funny guys, we also classify these particles in flavors and colors. Taste is called the number or amount of weak interaction has, lie the color refers to the amount of strong interaction you have. And that’s where the bosons are coupled with fermions. The colors and flavors of the particles (fermions) may change thanks to bosons (which remember that the forces) and according as fermions are associated with each other is said to have a taste. Delicious!. And why I call it colors and flavors?. Simple, it is a quick and easy way of knowing diagrams that type is each of the fermions. To indicate the color we know how to interact with the rest indicating the taste and know what it is. If you see the image, each type (is 6, for now) are the flavors, so you can see how simple it is (no name given). Changing colors and flavors is precisely the interactions between fermions by bosons. There is a whole big and huge compendium helps to know what happens if such a thing happens or how they interact is the gauge field theory. Something that, although it seems complicated, it is not so as it is very limited and it is a simple mathematical operation, which greatly simplifies things. Obviously, all this is complicated and you can put high-sounding names like “quantum cronodinámica” field, Yang-Mills or Feynman diagrams (which serves to paper and easily collision between particles, energies and passing) . Although the important thing is the base and know that everything that I tell you first sack mathematically and then, he was to be true. To understand some fundamental particles and those things that sound like Chinese, are not at all magical or complicated things. Another day I speak of fundamental particles and anti-particles, another field that is so cool.